Fresh skirmishes between the Spanish government and some Spanish regions have taken place this afternoon, both ahead and during the meeting of the so-called Fiscal and Financial Policy Council - a forum for the Spanish Treasury Minister Cristóbal Montoro (pictured) to meet his regional counterparts. The meeting is currently still under way, and the main item on the agenda is the 1.5% of GDP deficit target that Spanish regions will have to meet by the end of the year. As we argued in our recent briefing, the target seems unattainable for at least seven of Spain's 17 Comunidades Autónomas - which are expected to make cuts worth over 2.5% of their GDP. Despite recently having its deficit targets relaxed by the European Commission, the Spanish government has refused to do the same for its regions. Reports in the Spanish press widely suggested that today's meeting was simply going to confirm that all regions will have to cut their deficits to 1.5% of GDP by the end of the year - even if this involves making additional budget cuts. There's no point attending a meeting when everything has already been decided before. Fair enough. But quite controversial, given that Catalonia is one of the three Spanish regions which have already declared that they will ask the central government for a bailout. Furthermore, Catalonia's minority government, led by nationalist Convergència i Unió party, is only able to govern with external support from Spanish Prime Minister Mariano Rajoy's Partido Popular. And there is more. 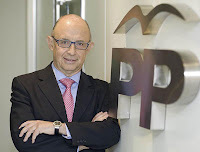 Andalusia - Spain's most populous region along with Catalonia - did go to the meeting with Mr Montoro, but abandoned the 'negotiating' table in protest against the government's decision to leave the 2012 deficit target for regions unchanged. As we have argued here, regions will not make or break Spain financially. However, the latest events are yet another indication of how the clear difficulties in reining in spending at the regional level can undermine the Spanish government's credibility vis-à-vis its eurozone partners and the European Commission. P.S. : Not really a regional issue, but still related to Madrid's credibility. The Spanish government was due to send its budgetary plans for 2013-14 to Brussels by the end of today, but has failed to do so. Perhaps not the biggest of deals, but the deadline was part of the agreement under which Spain was given an extra year to bring its deficit below 3% of GDP. Last week, Republican Presidential candidate Mitt Romney suffered a number of gaffes on his visit to London, including publicly questioning whether London would be able to cope with the pressure of hosting the Olympics, prompting a choice riposte from David Cameron. “I'm not here to be a killjoy or to give lessons to the British. It's not worthy of France [but] the problem is that there are simply too many corporate seats. It will be up to French organisers to sort out this problem if a bid for a future games is to be successful”. 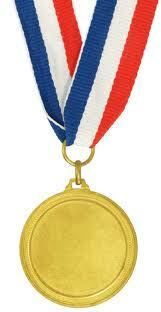 "The British have rolled out a red carpet for French athletes to win medals. I thank them very much for that, but the competition is not over." "We will put the French medals into the Europe pot, so that the British will be happy to be European." The Mail on Sunday yesterday run with a story under the headline, "Cameron urged to follow Spain's new edict: You can't move here without enough money in the bank", suggesting that the British government should follow Spain's recent example and adopt a tougher line on migrants from other member states. As so often with EU-related immigration stories, this one can be traced back to the 2004 EU Free Movement Directive - which we discussed at length in our briefing on EU asylum and migration policy, available here. The Directive sets out the foundations for one of the EU's key pillars - freedom of movement for people. However, contrary to popular belief, the Directive is not a free for all. It gives member states the right to require citizens from other EU countries who want to live/work in that country for more than three months to prove that they can support themselves, i.e. that they have a job or enough money to avoid becoming a burden on the state. Now, the Spanish government has recently adopted a new law after having its wrist slapped by the Spanish Court of Auditors. The Court had warned that Spain's liberal transposition of the Free Movement Directive "has implied a serious economic loss to Spain, especially because of the impossibility of guaranteeing the refund of expenditure caused by the provision of health and social services to European citizens." This is what the preamble of the new law makes clear that Spain wants to address. The new Spanish law specifies that, when a national of another EU member state decides to register so that he can stay in Spain beyond the initial three months, the person will have to provide evidence that he is financially self-sufficient and has a sickness insurance. As we understand it, all of these requirements do already form part of the UK's Immigration (European Economic Area) Regulations 2006 and a similar procedure to that proposed in Spain takes place in the UK via the-called 'right to reside' test, which essentially involves verifying that nationals of another EU member state who want to stay in the UK for more than three months are able to support themselves. The Commission has, counter-productively, taken the UK to Court over the 'right to reside' test, since it considers it discriminatory. However, for most practical purposes, the British test mirrors the Spanish one - although the one envisaged by the new Spanish law appears to cover different types of social benefits than the British one. This in turn brings us back to the rather opaque distinction EU law makes between 'social assistance' and 'social security' benefits, which is one of the main aspects of the dispute between the European Commission and the Department for Work and Pensions (see our report for some more background). So Spain is actually more or less doing what the UK already does. Still, it goes to show why, as we argued in our recent briefing, this issue needs to be managed far better if the benefits of free movement is to be maintained amid public scepticism. A quick-fire Friday afternoon quiz for our readers. Who said the following in February 2011? "As a Spaniard, I don't like being told what I have to do from outside." Well, it was Spain's then opposition leader Mariano Rajoy, who was elected as Spanish Prime Minister a few months later. 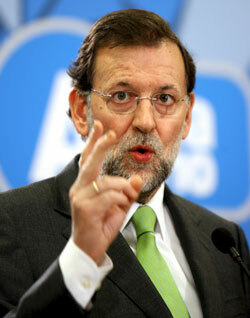 Will Rajoy have to eat his words...? Today's edition of French daily Le Monde - which, unlike a large majority of newspapers, is delivered to newsagents at noon - features an interesting story. According to the paper, the ECB and eurozone governments have intensified talks about the possibility of launching a 'concerted action' to keep Spain's (but also Italy's) borrowing costs at reasonable levels. The recipe is quite simple. The first step would be the eurozone's bailout funds - the temporary EFSF and, as soon as it is up and running, the permanent ESM - buying Spanish/Italian bonds on the so-called primary markets, where national treasuries try to sell newly-issued public debt. The ECB would follow suit, and would resume its bond purchases on the secondary market - after keeping quiet for almost five months. This would tackle the short-term emergency. The second step, according to Le Monde, could be giving the ESM a banking licence, so that it can have unlimited access to ECB liquidity. In order for this 'concerted action' to kick off, though, Spain has to make a formal request for an EFSF bond-buying programme. According to the paper, this could be overcome by offering Mariano Rajoy's government 'softer' conditions. Sorry for once again being the bearers of bad news, but this is not as easy as it sounds. First of all, the Spanish government remains very reluctant to request anything the markets may see as a fully-fledged bailout. Just think of how consistently Rajoy and his ministers have avoided using the word rescate (bailout in Spanish) when referring to the €100bn rescue package for the Spanish banking sector. Secondly, giving Spain 'softer' conditions could potentially open Pandora's box and prompt Greece, Ireland and Portugal to ask for the same treatment. On top of this, there are also other problems with this 'concerted action', which Le Monde seems to overlook. Should the EFSF start buying bonds, this would not necessarily mean that the German Bundesbank would suddenly change its mind and support massive bond market interventions by the ECB. See, for example, the Bundesbank's reply to Mario Draghi's latest remarks. Unusually late by German standards, but no less categorical in making clear that the bank "hasn't changed its opinion" (i.e. its opposition) to such interventions. Now, unanimity in the ECB's Governing Council is not needed with regard to bond purchases. But it would be politically very difficult to outvote the Bundesbank over and over again - not to mention that the Dutch and the Finns are likely to be sympathetic to the German concerns. On a more technical note, bond purchases on the primary markets can be addictive, similar to what has happened with ECB liquidity to eurozone banks. In other words, it could be quite difficult for, say, Spain to finance itself in a normal fashion after EFSF/ESM purchases are phased out. As we have stressed before, no-one wants to see a situation where the eurozone faces zombie states similar to the peripheral zombie banks now reliant on ECB liquidity. All very speculative at the moment (Le Monde does not actually mention any specific sources), but it's clear that things are moving quickly. 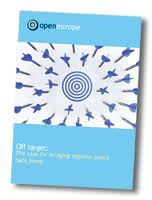 Keep following us on Twitter @OpenEurope if you want to keep up to speed! 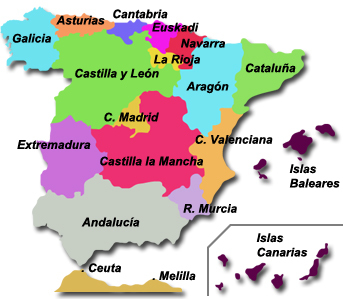 Its not just Spain that has a problem with its regions. Over in Germany, Bavaria is getting increasingly angry over the additional burdens imposed on Germany as a result of the eurozone crisis - both via the existing bailout funds and possible future burdens via eurozone debt pooling. This is because in addition to its strong regional identity, it is the wealthiest of Germany's 16 states; a bigger burden on German taxpayers therefore equals a bigger burden on Bavaria. "With Greece we have reached the end of the road. There must not be any further aid. A country which does not have the will to fulfil the conditions, or is not able to do so, must get a chance outside the euro”. Dobrindt’s intervention is noteworthy because it is the first time that a senior mainstream politician has explicitly called for the eurozone crisis - and longer term questions such as eurobonds - to be made into defining issues in next year's elections. Until now, despite accusing Merkel's government of poor political management, the SPD and Greens have broadly taken the same structural approach to the crisis - i.e. bailouts and savings/reform packages, albeit with additional emphasis on 'pro-growth' measures. It will be interesting to see if and to what extent Merkel and the CDU will heed Dobrint’s call to adopt a tougher tone. While this is unlikely to happen any time soon, the CSU’s resistance will severely restrict Merkel’s ability to place further eurozone rescue related burden on the German taxpayers in the remainder of the current parliamentary session and beyond. As Germany as a whole faces the question of how it will respond to the crisis in the longer term – with a range of options running from a break-up to more political and economic integration – expect Bavaria to be at the forefront of the resistance to the latter option. To the extent that the size of these sovereign premia [i.e. 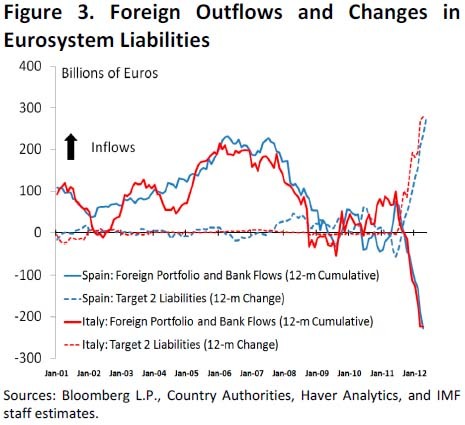 the high borrowing costs of Spain, but also Italy] hamper the functioning of the monetary policy transmission channel, they come within our mandate...Within our mandate, the ECB is ready to do whatever it takes to preserve the euro. Believe me, it will be enough. Draghi's words were seen as a hint that the ECB could intervene in the secondary bond markets after a 19-week stop. This sent Spain's borrowing costs significantly down, with the interest rate on ten-year bonos falling slightly below 7% - which remains unsustainable in the long term, but is better than the mind-boggling 7.7% touched yesterday. On the Spanish regions' front, the government of Castilla-La Mancha - headed by Dolores de Cospedal, Secretary General of Rajoy's Partido Popular - refused to rule out seeking a bailout from the Spanish government, although it stressed that it doesn't need one "urgently". Meanwhile, Catalonia's Economy Minister, Andreu Mas-Colell has made clear that his region won't accept any "political" conditions the central government may try to attach to the loan Catalonia has decided to request. His counterpart from Comunidad Valenciana, Máximo Buch, predicted that the Spanish government could consider boosting its €18 billion Autonomic Liquidity Fund (FLA, the rescue fund for Spanish regions) later this year, once all the Spanish regions in need of a bailout have shown their hand. Interestingly, Buch also suggested that several "shirking" regions will eventually follow Comunidad Valenciana's example and request a loan, sooner or later. On a slightly separate note, Bankia's former chief Rodrigo Rato - who also served as Spanish Economy Minister and IMF Managing Director - has been heard by Spanish MPs today, and said a couple of interesting things. First off, he claimed that the Bank of Spain "ordered" him to go ahead with the merger of Caja Madrid and Bancaja, despite it being quite clear that the two cajas held a worrying combined total of doubtful real estate assets. For those unfamiliar with the story, Caja Madrid and Bancaja are two of the seven Spanish savings banks that form part of Bankia, which is effectively a conglomerate. Together, the two form almost 90% of Bankia. 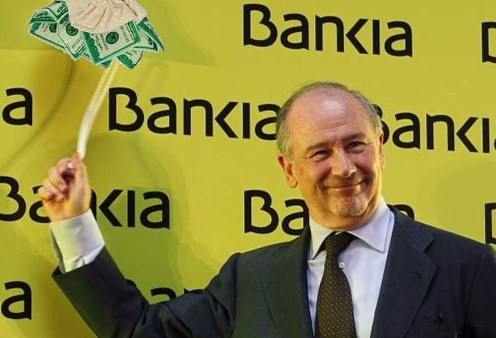 Rato (in the picture) also told MPs that, in May, he submitted a restructuring plan for Bankia to the Spanish Economy Ministry, but was ignored. Rato's plan involved a loan of 'only' €6 billion from the Spanish government - i.e. four times cheaper than the almost €24 billion Bankia is now in line to receive. As Spain seems to have wiped anyone else away from eurozone crisis-related headlines, we have published a new briefing looking at how the Spanish crisis could evolve in the near future – focusing our attention on the role of the regions and potential bailout scenarios. Forgive us a bit of self-praise, but we have repeatedly stressed the risks involved in Madrid being unable to rein in spending at the regional level (see here and here, for instance). In our new briefing, we argue that, at the end of the day, the regions alone will not make or break Spain financially (more likely, it will be the banking sector, a risk which we also highlighted at length). In fact, if they continue to rely on the central government for funding, this could increase Spain's financing needs for this year by an extra €20bn - not pocket change, but still around only 2% of the country's GDP. However, further damages to the credibility of Mariano Rajoy's government vis-à-vis its eurozone partners would be inevitable. Furthermore, we believe regional problems combined with banking sector issues and other pressures could ultimately push Spain into a fully-fledged bailout. But would there be enough money in the pot if this happens? Probably not. 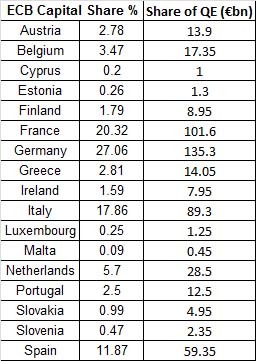 In fact, we estimate that taking Spain off the sovereign debt markets for three years in a Greece-style bailout would cost between €450 billion and €650 billion. This is both economically and politically impossible at the moment, given that the lending power of the eurozone's two bailout funds, the EFSF and the ESM, will only total €345 billion this year, and will rise to €500 billion in mid-2014. Therefore, we suggest that the most likely scenario is a combination of measures, involving a precautionary loan of around €155 billion combined with a new bout of ECB liquidity. However, even that could, at best, only buy Spain six months to a year. It's election campaign season in the Netherlands, with Dutch voters due to choose their next government on 12 September. Caretaker Prime Minister Mark Rutte's VVD party has come up with a rather original way of planting the eurozone crisis into domestic political debate. They may have the cup, not our creditworthiness. Italy or Spain will become European football champions [as we mentioned, the post is from 29 June, two days before the Euro 2012 final]. Now they also need to become champions in cutting their budgets, because if we get things our way, there will be no arrangement through which they can benefit from our financial discipline while not putting their own things in order. Please like if you agree! To date, the VVD post has 864 'Likes'. As the elections get closer, tough rhetoric on the eurozone crisis, such as this, is likely to become a feature as Dutch politicians bid to 'steal' votes from Geert Wilders' far-right, notoriously anti-euro (and anti-EU), PVV. Today, Dutch magazine Elsevier also reported that, at last week’s meeting of the ‘Future of Europe’ group, organised by German Foreign Minister Guido Westerwelle, Dutch Foreign Minister Uri Rosenthal warned that it was not the time to discuss any further transfer of national powers to the EU, especially in areas such as pensions, labour market and social security. In light of what we have seen, for instance, in Finland ahead of the latest presidential elections, the picture above is another example of how further fiscal integration and eurozone bailouts are now at the forefront of election campaigns in the Triple-A countries. At a meeting of Europe ministers today, the UK government is set to be outvoted on the size of the EU’s 2013 budget. Having pushed for a freeze without a last-minute deal, Britain will be forced to accept a 2.8 per cent increase. This is a compromise position that gives scant consolation to UK taxpayers who will have to fork out an additional £350 million for no good reason whatsoever. Unbelievably, the Commission and some member states were pushing for a 6.8 per cent increase. Decisions on the annual budget are decided by so-called qualified majority voting system (QMV) with the European Parliament also having to give its assent. This is the issue on which the UK is set to get stuffed this week. However, each member state has a veto over the EU’s long-term budget – known in Brussels speak as a Multiannual Framework (MFF) – which usually covers a seven-year period. This underlines how incredibly important it is for the UK government to utilise its veto to get the EU’s long-term budget right. Unfortunately, in talks over the EU's long-term budget (set to run between 2014 and 2020) – also up for negotiation at the moment – the UK is merely pushing for a freeze to overall spending. While this strategy has some merits, it won’t achieve anything above and beyond what could be achieved by simply vetoing the MFF. This is because under EU rules, if a new deal over the MFF can’t be reached, the previous year’s budget is carried over, adjusted to inflation – exactly the real terms freeze that the government is currently pushing for. This is not a shrewd negotiating strategy. So what should the UK government do instead? There is no shortage of EU spending areas to reform. For example, it’s madness that, as Europe grapples with a solvency, competitiveness and banking crisis – all at once – around one-third of the EU budget still goes towards subsidising landowners, irrespective of whether they’re engaged in any meaningful economic activity. But the UK government would secure a hugely disproportionate benefit by one simple move: repatriating the EU’s so-called structural funds back to Britain and other wealthy states. The structural funds are meant to help poorer regions catch up with richer ones, but in reality a large portion of the money is merely being recycled between some of Europe’s richer regions and countries, and spent on projects with little, no or negative comparable impact. Of the 37 regions under the EU’s classification system, 35 pay more in to the system than what they get back. This means that many disadvantaged UK regions – such as the West Midlands and Northern Ireland – end up as net contributors. Those countries that would lose out – Spain, Italy and Greece –need a different kind of financial support to that currently is offered by the funds anyway. For example, 30 per cent of the funds in Spain still go towards roads and infrastructure – the opposite of what the country with its bust construction sector needs. This would be the best opportunity of putting this right. In terms of a simple and easy to communicate policy proposal, this is an open goal. In terms of negotiation dynamics, despite it only ever being able to deliver a freeze, as opposed to an end to UK payments, Britain’s veto is still powerful. Not having a new MFF in place would be extremely messy and most member states, including the new ones that want a new deal to benefit from phased-in farm subsidies, have huge incentives to strike a new bargain. The UK will almost certainly get something substantial in return if it sticks to its guns. Mr Cameron would waste a perfectly good EU veto – and a chance for a massive credibility boost on Europe – by letting this one slide. 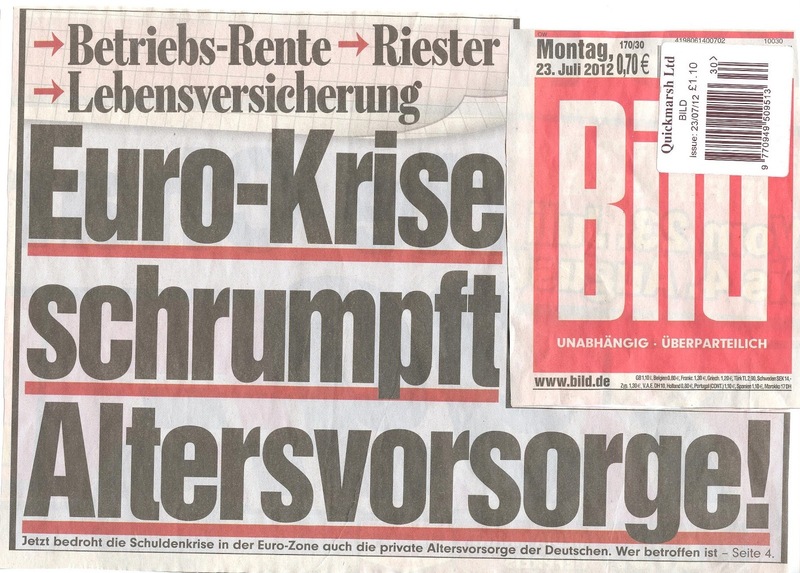 It was just a matter of time: The front page of today's Bild warns about the effect the crisis will have on millions of Germans’ pensions. 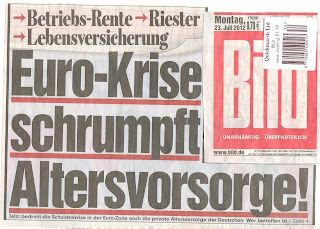 Under the headline “Euro crisis shrinks pensions”, Bild reports that the occupational pensions of 17 million Germans are threatened by a combination of the low interest rates on the government bonds of the remaining creditworthy nations – which pension funds heavily invest in – and by the low rate of interest (0.75%) set by the ECB in an attempt to stimulate the economy, which it is feared will lead to inflation in the longer term. In turn, the paper claims, this will erode the value of pension payments, citing calculations by Professor Stefan Homburg from the University of Hannover which show that given an inflation rate of 5%, a €1,000 pension payment would only be worth €614 in ten years’ time (although at OE we think that, given current policies, such an inflation rate is someway off). Although there is clearly an element of scaremongering here, this is the kind of stuff that brings the crisis to life for people, and angry retirees are not a constituency that any government is advised to take lightly. It also highlights the ever-present tensions between different interest rate needs of the 17 euro economies. Sooner or later, there will be significant pressure from within Germany on the ECB to raise rates, possibly leading to a political tug of war between member states' representatives - this seems inevitable at some point if Germany continues to outgrow other parts of the eurozone so significantly. It also shows that perversely, the record low interest rates on German sovereign debt are not wholly a positive factor for German citizens. At the end of the day, the outcome of this crisis may be decided in large parts by its impact – be it tangible or perceived – felt by German citizens in their everyday lives. Once again the crisis came roaring back this weekend, with a terrible Spanish debt auction last week and rumours that a raft of Spanish regions will need aid from the central government (as we predicted here) sending Spanish 10 year borrowing costs skyrocketing to a record 7.55%. The questions now turn to how long the central government can fund itself and its regions at these levels. By all accounts Spain has done well to ‘pre-fund’ a large amount of its debt this year (meaning its already borrowed most of the money it needs to), while the average interest rate on its debt remains fairly low (around 4%) while the average maturity of its debt is around six and a half years – in all not a bad debt profile considering everything. 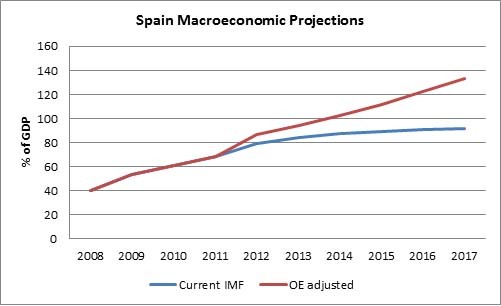 However, around 10% is soon to be added to the debt to GDP ratio while the mounting costs of bailing out the Spanish regions will only exacerbate this. All the while growth continues to stall – the Bank of Spain announced this morning that the Spanish economy contracted by 0.4% in the second quarter of this year, to add to the 0.3% decrease in the first quarter. …looking at the Spanish state’s funding needs over the next few years, even with the recapitalisation of the banks taken care of, it faces a huge level of debt refinancing. 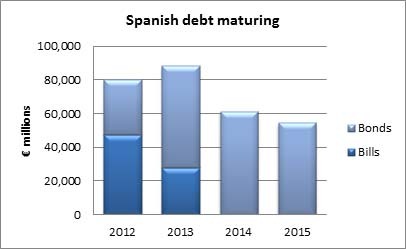 Up to mid-2015 Spain faces funding needs of €547.5bn, over half its GDP and a large majority of its debt. The Spanish central government will need to rollover €209bn in bonds and €75bn in bills, equal to almost 30% of GDP and close to half of its official debt. This will become increasingly difficult if Spanish borrowing costs remain at elevated levels. 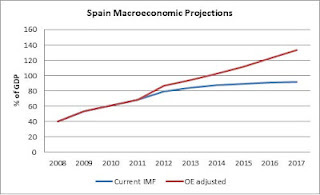 From mid-2012 to mid-2015 Spain will have to finance a deficit worth €179bn – that is assuming it manages to stick to the IMF projections and its deficit cutting plans. Spain also faces large stocks of unpaid bills at all levels of government, totalling around €105bn. These are due to be wound down over the next year or two despite having been at elevated levels for some time. Ultimately these funds are mostly owed to domestic creditors meaning withholding the money for longer will be counterproductive for the Spanish economy. (In light of this weekend's rumours its interesting to note that the recent boom in arrears came nearly exclusively from regional governments). …the amount to be rolled over in the next year or two is still particularly large…This will further increase the pressure on the banks to load up on Spanish sovereign debt, with potentially huge consequences if this loop ever breaks down. If the problems in the banking sector are not resolved their ability to continue funding the state will at some point come under huge pressure, if this falls apart Spain may find itself without any willing creditors. David Cameron is quoted in today’s Telegraph saying that he wants to negotiate a “new settlement” with the EU with powers returned to Britain, but that he would never campaign for an “out” vote in a referendum. “If your vision of Britain was that we should just withdraw and become a sort of greater Switzerland, I think that would be a complete denial of our national interests”, he said. There’s virtually no clean ‘out’ option to fall back on. Whether EEA, bilateral FTA or Turkey+, all alternative models also require renegotiation with, and approval by, the other 26 member states, meaning that the ‘what happens if they say no’ question still applies also under an ‘out’ scenario. The only way Cameron can get around that is by explicitly stating that he’s willing to fall back on WTO rules – which would not require anything – but which would instantly turn the entire UK business community, amongst others, against him. Having said that though, those who criticise Cameron have a point First, demands for Britain to leave are not a negotiation ploy but are real, and will intensify absent new EU membership terms. The UK government cannot be seen as defending EU membership at ‘any cost’. Secondly, as we’ve said before, if the EU becomes a political extension of the Eurozone, i.e. if directly or indirectly greater Eurozone integration spills over to Britain, for example via a banking union, Britain simply cannot remain inside – politically, democratically or economically. Finally, as we argue in our recent report on EU-UK trade, there are scenarios under which the exit door could suddenly look a lot more attractive, including if single market liberalisation stalls and if the Eurozone grows more protectionist internally and externally, preventing UK business from taking advantage of growth opportunities around the world. Therefore, the smartest thing for Cameron to say would be: As we set out in the Tory manifesto, we remain committed to EU membership and will not seek an “Out” vote. However, we must also acknowledge that the UK public is understandably growing more restless by the day. Absent new EU membership terms for Britain, while I personally would be against it, there may come a day, when it will no longer be possible to resist pressure for the UK leaving the EU, which would create a hugely unpredictable situation that would be in Berlin’s and Brussels’ interest to avoid. 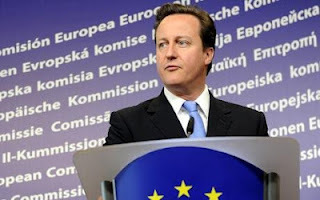 David Cameron should frame the renegotiation of the UK’s membership terms as a bid to save the UK’s EU membership – that is a far more powerful negotiating tool than any short term threat for him to campaign to leave because, it could potentially gain support from some unexpected quarters, it is true and does not rely on the promise of a politician. We assume many Spaniards are growing more and more frustrated with the fact that they have to dig into the websites of foreign governments and parliaments to find out details of the bank bailout their country is set to receive. 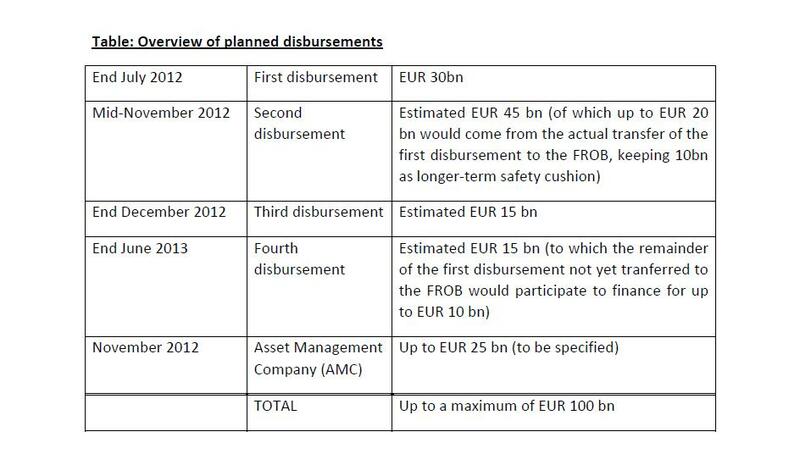 After the 'confidential' EFSF proposed timeline we took from the website of the Dutch finance ministry and analysed on our blog, new information emerged from the dossier the German finance ministry prepared from German MPs ahead of today's vote on the Spanish bank bailout in the Bundestag (available here). The 139-page dossier includes a "Master Financial Assistance Facility Agreement" - never seen before - between Spain, the Spanish national Orderly Bank Restructuring Fund (FROB), the Bank of Spain and the EFSF. The draft agreement confirms that, as expected, once the eurozone's permanent bailout fund, the ESM, takes over, the loans Spain receives will not become senior to Spanish debt held by private investors. 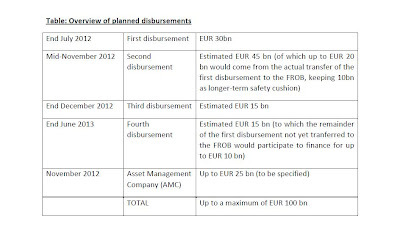 However, the most interesting part (see page 78 of the dossier) concerns the fact that, in principle, Spain could request that part of the €100 billion rescue package be used for purposes other than bank recapitalisation - including direct loans to the Spanish government and purchases of Spanish debt on both the primary and the secondary markets. In other words, if it turns out that Spain does not need the entire amount to sort out its troubled banking sector - which the government has suggested will be the case (although we don't agree, see here) - it could, for instance, ask its eurozone partners to use the cash left to buy Spanish bonds and try to keep its borrowing costs down. This would imply a revision of the Memorandum of Understanding (MoU), which would almost certainly include tougher conditions - probably directly relating to government spending and reforms as well. All very speculative at the moment, but it's still interesting that the agreement opens for Spain seeking something closer to a fully-fledged bailout deal. "The up to €100 billion, which the eurozone has undertaken to provide to Spanish banks is to do just that, it is only for that purpose and not for any other." This seems to be only a half-truth, though. In fact, the draft agreement does indeed specify that, for the moment, the entire amount is being provided in the form of a "Bank Recapitalisation Facility". However, the document also establishes that Spain can make an official request to move part of the money to another facility, provided that the combined total does not exceed €100 billion. 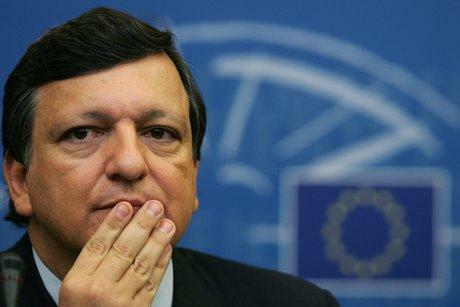 In any case, the bailout agreement will be wrapped up by eurozone finance ministers in their conference call tomorrow. Meanwhile, the day has not started well for Spain. In this morning's debt auction, almost €3 billion of medium and long-term debt was sold, but with higher interest rates and significantly lower demand than in the previous auction. The interest rate on Spain’s ten-year bonds reached above 7% again – a level widely seen as unsustainable. 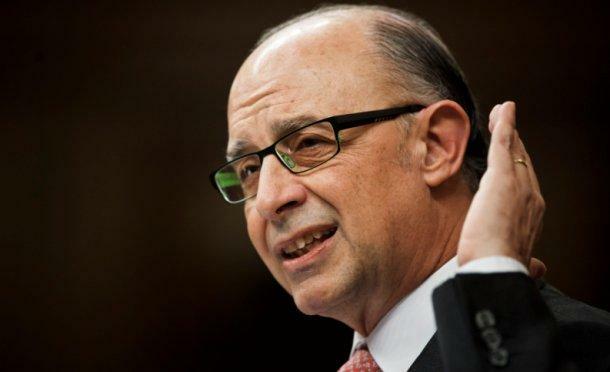 All this happened while Spanish Treasury Minister Cristóbal Montoro (in the picture) was telling MPs that “There is no money in the public coffers to pay for services.” As usual, you can follow the latest developments of the eurozone crisis via our Twitter feed @OpenEurope. There’s been another interesting report put out by the IMF today in the form of its ‘Article IV consultation on the euro area’ (essentially an economic assessment of the eurozone). Further liquidity provision. This could encompass additional multi-year LTRO facilities, coupled with adjusted collateral requirements, if needed—including a broadened collateral base and/or a lowering of haircuts—to address localized shortages. The associated credit risk to the ECB would be manageable in view of its strong balance sheet and high levels of capital provisioning. Nevertheless, one of the disadvantages of the LTRO facility is that it tends to strengthen sovereign-bank links (see Box 5). Quantitative easing (QE). The ECB could achieve further monetary easing through a transparent QE program encompassing sizable sovereign bond purchases, possibly preannounced over a given period of time. Buying a representative portfolio of long-term government bonds—e.g., defined equitably across the euro area by GDP weights—would also provide a measure of added stability to stressed sovereign markets. 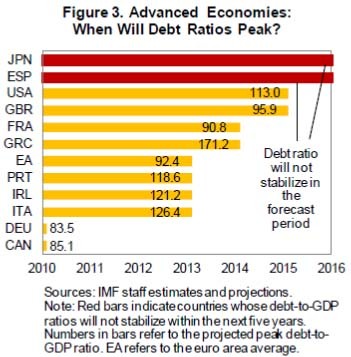 However, QE would likely also contribute to lower yields in already “low yield” countries, including Germany. As you’ll notice both recommendations come with clear caveats – strengthening the sovereign banking loop with the LTRO and the fact that QE would need to be spread across the entire eurozone. We’ve discussed both at length on this blog and in our research but a refresher never hurts. The LTRO has certainly driven the sovereign banking loop much closer, engraining this connection at the heart of struggling economies (far from ideal) while encouraging the nationalisation of financial markets once more. All this prompted the well-known and incredibly complex banking union discussion. The IMF also notes a further problem with more LTROs, asset encumbrance. A complex issue but essentially banks are running short of quality assets to post as collateral to borrow from the ECB (see graphic below). So even if further LTROs were offered they may not be able to take advantage of them. If the ECB went down this route and faced this problem it would have little choice but to widen its collateral rules or reduce the valuation ‘haircuts’ (which decide how much banks can borrow against certain collateral) thereby taking even greater amounts of risk onto its balance sheet. In terms of QE we’d point you to our report from December and the table below. Ultimately, it would have to be a huge spate of QE to provide enough of a boost to the countries in trouble, but that would also create a huge amount of money flowing into countries such as Germany (which is already concerned about an asset and property bubble). We’ve argued before that a more significant role in the crisis for the IMF wouldn't be the worst thing in the world. Generally it has provided a more realistic assessment of the situation. Unfortunately, in this case, the problems outlined above are only the technical ones relating to a greater role for the ECB, the political obstacles remain almost insurmountable in the short term. As with the UK government, we’d recommend the IMF engage but avoid spending too much time of policies which are politically nearly impossible and technically challenging. As if Mario Monti didn't already have more than enough to work on this summer, another urgent item has taken the top spot on his agenda. 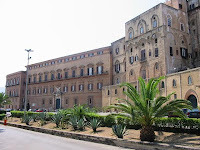 The regional administration in Sicily (whose building, the beautiful Palazzo Normanni in Palermo, is pictured) is at serious risk of default. Its debt stood at a record €5.3 billion at the end of last year. The governor, Raffaele Lombardo, had already suggested that he would step down at the end of July. However, Monti felt the need to send him a letter yesterday, urging him to confirm his intention to quit. Given the shambolic state of affairs in Sicily we will overlook the fact that this essentially involves a technocrat calling on an elected politician to quit - far from ideal, but it's clear that Lombardo has to move on. Is Sicily on the verge of bankruptcy? I think so. I'm afraid we will soon no longer be able to pay the employees' salaries. Politically, the situation is obviously serious, but not particularly controversial. Regional autonomy in Italy is not the same thing as, for instance, in Spain. The right for the central government to step in and grab the helm if regional administrations go off course is enshrined in the Italian constitution. However, the unbelievable list of waste and mismanagement examples which led Sicily so close to default (some of which featured in our 50 examples of EU waste, 2010 edition) offers a clear explanation of why Italy still has a lot to do to find its way out of the woods of the eurozone crisis. 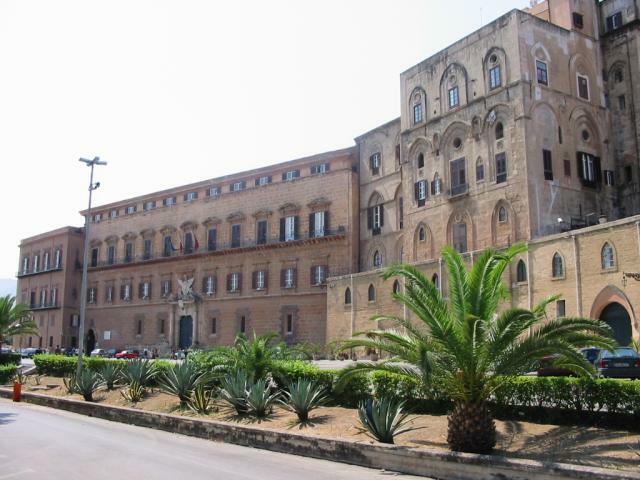 - Sicily's regional administration employs the same number of directors as 15 other Italian regions put together. 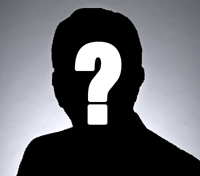 This means that in the island's administration there is on average a director for every nine employees (the average in the Presidency office is one for every five or six). - Back in 1984, Sicily decided to buy two killer whales (yes, you read it right) from Iceland, at a cost to the taxpayer of over 200 million of Italian lire - i.e. over €100,000. They were supposed to be admired by tourists visiting a water park in Sciacca, in the province of Agrigento - on the south-western coast of the island. A real shame that the park was never finished and the killer whales had to spend the rest of their lives in a swimming pool, at a cost of 6 million of Italian lire - i.e. over €3,000 - a month. Spain and Finland last night reached a deal on the provision of collateral for the Finnish share of the Spanish rescue package. This is the second collateral deal which Finland has struck, following the one on the second Greek bailout, although thankfully this one seems slightly simpler and much more transparent. Finland will receive €770m from Spain’s deposit guarantee fund which will be invested in Triple-A eurozone government debt and held in an escrow account. The idea here is that the deposit guarantee fund isn’t part of the state therefore no issues will arise in terms of subordinating existing debt holders (see here for a fuller discussion on this issue of ‘negative pledge clauses’). A technicality but it should hold and at least it allows more transparency since the deposit fund is still a somewhat public institution (rather than private commercial one as in the case of the Greek banks which provided the collateral for the previous deal). The amount covers only 40% of Finland’s contribution to the Spanish bailout, based on the largest expected losses under a default. Logically this may seem to be enough given the size of the Spanish economy and historical recovery values from defaults. Unfortunately, if it gets to the stage of a Spanish default (a very unlikely scenario), the implications for the eurozone are likely to be huge (possibly a full break up) meaning 40% collateral would be of little value. Although in that scenario Finland would have a lot more problems to worry about that just recovering the bailout loans. The collateral will stay in place even if the loans are transferred from the EFSF to ESM. This is a result of the transferred loans not having seniority, if they did we’re sure the collateral deal would be unwound once the ESM was in control. Finland has also agreed to forgo any potential profits form the loans and pay in its capital to the ESM, the eurozone’s permanent bailout fund, in one instalment rather than five. The forgoing of profits is an interesting precedent, although given the incredibly low premium charged on the Spanish loans (as we discussed here) it is unlikely much will be made in this instance. The paying in of capital will force Finland to stump up cash quicker than expected but will amount to only €1.44bn, which should not be a problem given the strong state of the Finnish economy. The Finnish parliament will debate the deal on Thursday and likely vote on it on Friday. Any euro debate in the Finnish parliament is always heated but this one seems likely to pass without incident. It also means the deal will be ready for the eurozone finance ministers’ discussion on Friday afternoon where the Spanish deal is expected to be finalised. All in all, it’s fairly similar to the Greek deal and despite being more public still fairly limited on precise details. One further point to note is the speed and relative ease at which the deal has progressed – particularly in that objections from other member states have been muted. This is to be expected, the rubicon had already been crossed with the Greek deal, but we also think the points which Finland gave in on (profits and speeding up ESM payments) may have played a role - both points which countries with higher debt levels may have been keen to avoid. We are therefore delighted that MPs accepted the central tenet of our recommendations, especially as Open Europe was the only organisation profoundly critical of the status quo to submit evidence. However, we consider that there is a realistic prospect of the government being able to secure this reform in 2014 – and that the government should be prepared to veto the next MFF, currently up for negotiation, in order to make this demand more credible – whereas the Committee sees this as an objective for 2020 and beyond. Domestically, it could enjoy cross-party support given that it was originally a policy championed by the previous Labour government, and areas represented by Labour MPs stand to be the biggest winners under this reform. Berlusconi's comeback: What could it mean for Italy's future in the eurozone? The jubilant chanting and cork-popping in Rome last November now looks premature. In a sensational U-turn, Silvio Berlusconi has decided to run for Prime Minister in next year’s elections. His comeback may have huge implications for Italy’s future in the single currency. Over the past few weeks, the 75-year-old former Italian Prime Minister has outlined his personal way forward for Italy in the Eurozone crisis – quite revolutionary compared to Italy’s traditional view of its euro membership. He has made clear that the solution to the Eurozone crisis is for the European Central Bank (ECB) to become the ultimate backstop for struggling Eurozone countries. If this scenario fails to materialise, there are only two alternatives left. The first, in Berlusconi’s own words, would be Italy and other peripheral euro members saying “ciao ciao” to the single currency. 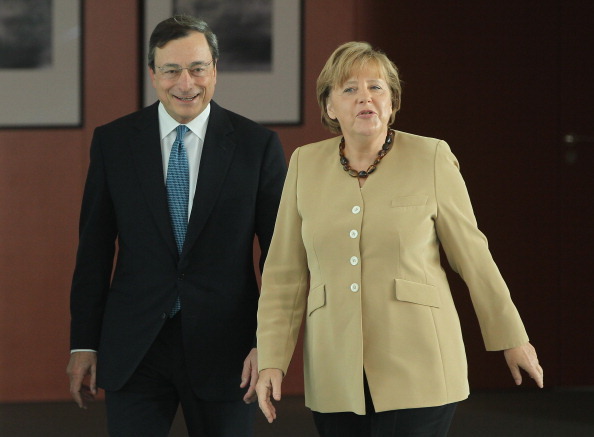 The other would be Germany leaving instead – clearing the way for the ECB to act as the Eurozone’s lender of last resort. Pouring more fuel on the fire, Berlusconi described the prospect of a future outside the single currency as “no blasphemy” and “not the end of the world” for Italy. Those remarks were by no means the swan song of a disgraced leader. If there is one thing Berlusconi knows better than many Italian and European politicians, it is how to tell people exactly what they want to hear. And you can bet that he is well aware that riding the anti-euro (and anti-austerity) tiger can pay off in votes these days – as the apparently unstoppable rise in the polls of comedian Beppe Grillo’s Five Star Movement shows. Italy leaving the euro remains a distant prospect. Yet, if Berlusconi’s new line of thinking becomes official party policy, the result would be one of the largest political parties in Italy openly saying that the country’s support for the single currency should no longer be unconditional. Add Lega Nord and the Five Star Movement, and the number of anti-euro voices across the political spectrum starts to look worrying. The German press has reacted to Berlusconi’s comeback in a particularly telling fashion – with headlines ranging from centre-left Süddeutsche Zeitung’s “The candidacy of a nightmare” to centre-right Die Welt’s “The Godfather, Part IV”. Nonetheless, Berlusconi’s return could paradoxically turn out to be good news for Germany. Italy’s centre-left Democratic Party – currently the most popular in opinion polls – could be encouraged to form an anti-Berlusconi coalition with other moderate centre parties. This would break its tradition of seeking allies among the far-left, whose ideological background is incompatible with many of the reforms initiated by Mario Monti’s technocratic cabinet. Despite consistently rejecting the idea so far, Monti might then be willing to stay on as the head of this reformist coalition, provided that it receives broad support in next year’s elections. Unlike with Berlusconi, many Italians would probably forgive him for the U-turn. Once again the lack of clarity coming out of the Spanish government has resulted in it getting a bashing by the press over the past few days, both in Spain and across Europe. The source this time was the press conference on Friday announcing the new €65bn in austerity measures – unfortunately at the time the government seemed unwilling to shed any light on exactly how and where these cuts will be made. Fortunately, the Spanish press has published a paper circulated to foreign investors by the Spanish government, which fills in some questions regards the structure of the new fiscal consolidation programme (see here for the full document). · Much of the burden of implementation, particularly on the tax front, will fall on the autonomous regions. The disputes between the regions and the central government is well documented and could potentially lead to implementation problems, particularly since many of them may be more inclined to drag their feet on fiscal consolidation measures which could dent economic activity in their region. Overall then, this is the most detail we have seen on the planned cuts but yet falls woefully short of providing a clear picture on how exactly the Spanish government will go about making the necessary savings within the necessary time frame. Given the huge questions surrounding the Spanish bailout, many of which are out of the government’s hands, it’s more important than ever for the Spanish government to bring clarity to the issues which they can control. Throughout the eurozone crisis, we have often highlighted the gap between the kind of ‘shock and awe’ decisions expected by financial markets, and what national democracies are able to deliver. Nowhere has this been more evident than in the on-going constitutional tug-of-war between the German government and the country’s Constitutional Court (see here, here and here for background). 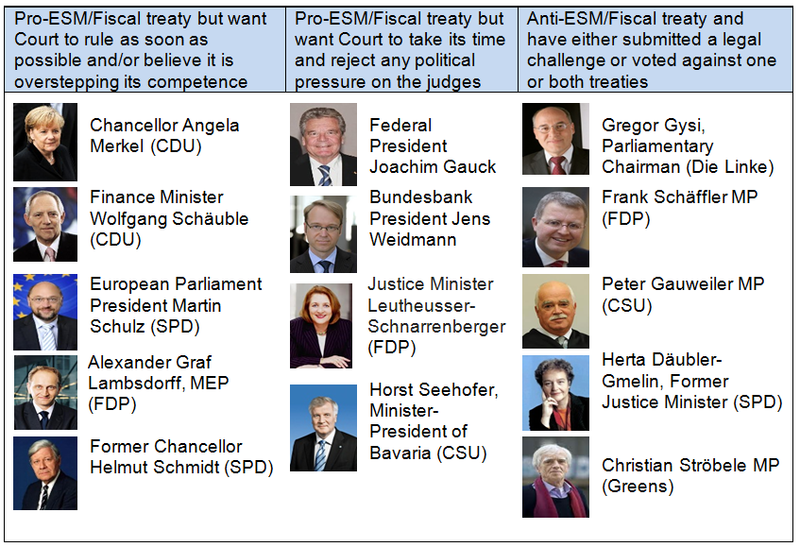 The latest chapter concerns a series of legal challenges against the ESM and fiscal treaty, on the basis that they violate the sovereign budgetary rights of the German Parliament. The stakes are very high given that the Court could, in theory, strike down the best part of Merkel and Schäuble’s efforts over the past year. 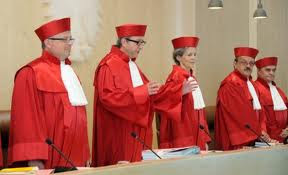 It is unlikely that the Court will do so given the ramifications, but at Tuesday’s public hearing, the judges (pictured in their traditional red robes) indicated that they would take their time before issuing a ruling; up to three months to decide on whether to issue a temporary injunction pending a full decision on constitutional compatibility early next year. This delay is most unwelcome news for Merkel who is desperate to reassure financial markets and other political leaders that Germany is serious about the eurozone rescue, which is why she expended a lot of political capital in pushing the two treaties as a package measure through the German parliament in record quick time, and was angry that after all that German President Joachim Gauck refused to give his assent after the Court asked him to allow them time to consider their legality. The problem is that the Court was specifically designed – by the British and the Americans no less - to counteract the concentration of power and rash decision making by other federal institutions, a sort of systemic circuit breaker. It is for this reason it is tucked away in sleepy Karlsruhe, the opposite end of the country to Berlin and previously Bonn. “A considerable postponement of the ESM… could cause considerable further uncertainty on markets beyond Germany and a substantial loss of trust in the eurozone's ability to make necessary decisions in an appropriate timeframe”. Meanwhile the Guardian reports that Chancellor Angela Merkel allegedly told a private meeting of her CDU party that the Court was “pushing the limits” of her patience, while Martin Schulz, the President of the European Parliament complained that some of the Court’s verdicts are "characterized by great ignorance”. Conversely, Bundesbank President Jens Wiedmann, also giving evidence, warned that “a quick ratification is no guarantee that the crisis will not escalate further". 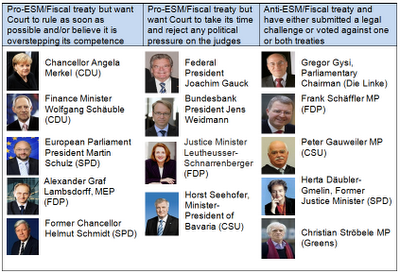 While the Court, even in the opinion of some of the litigants, is not expected to torpedo the eurozone rescue at this stage (although they take a slightly more pessimistic view over on FT Alphaville), the red lines of the existing constitutional settlement are looming ahead, with most forms of debt pooling that many have called for - such as Eurobonds or a banking union - lying on the opposite side. As the debate over the future of the eurozone will continue to rumble on, expect further tension in the broadly consensual model of German politics between further European integration on one hand and preserving the current constitutional settlement on the other.